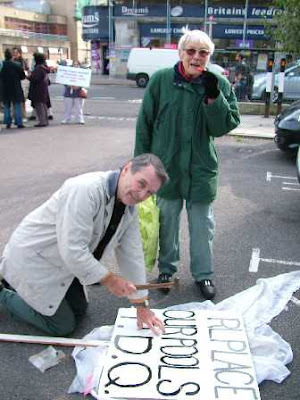 At the protest march last Saturday in Ilford Town centre lead by the Swimmers Users Group, an elderly pensioner hammers home the point, but forgets to complete his “E” despite the watchful attention of a well known local ex-Headmistress. Quite a good report, except that they fail to mention that the structural report in 1997 arrived at a time when they were the minority administration, which lasted until 2002. So the elderly pensioner made one L of a mistake. I would say a printing error makes you much more noticeable! In the Recorder centre pages today, I noticed another clever typo error and I could only catch the Q in Mr Sharrock's distinctive panel. Me wants to know what the three letters at the bottom of the panel mean? Now,if you sound the letters in French, it is rather interesting. Of course I should prefer a 50m pool to two 25m. Paris has 18. London had had Crystal Palace which is being renovated I believe, and the Olympic pool has yet to be built. However, when I asked a Councillor where the money was coming from for 50m, I was given a very confident reply. I have also been told that 50m is more economical than two 25m. Why put forward an impracticable scheme to raise false hopes and tell me that the Town Centre scheme was faulty? True, it was when the Olympics were expected to have some spin-off for our needs. Elderly pensioner was text-messaging as he is very with-it. To be logical, I can see why one 50m pool is more economical that two 25m, this because there are two vertical walls less to erect to separate the two pools. There must be a reason why 33m and a third is not considered an option but I think 33 odd metres are ok for most swimmers. Only the top range few need to practise 50m. What is amazing however is the time scale of the planning. No way could they have sold the allotments in time for replacing the swimming pool. Had the relocation/disposal gone smoothly, they should just now be applying for permission to dispose and then there is a long wait (a year) to gain permission (if one is not cheating, that is) and then the land must be kept available for several years before it can be sold. So, were the people involved in hoping to raise the cash aware of this or not? I am expecting the standard reply to this. I am beginning to understand the 'silent treatment' which is a bit like a trip to Coventry (no offence meant to Coventry).